Despite their best efforts, the Los Angeles Lakers can’t stop winning games. They entered tonight’s game against the Pelicans on a four-game winning streak, and they extended it to five with a 108-96 victory. They absolutely did not want to beat the Pelicans, as the win put them out of reach of the Suns, but even a truly dumb starting lineup featuring four power forwards couldn’t stop destiny. Having already shut down essentially every player of value this season, the Lakers turned to a bold new approach to losing: Metta World Peace. The 37-year-old is beyond washed up at this point, but he started and logged 25 minutes against the Pelicans. That’s his highest total of the year by a wide margin and he made the most of his time on the court, taking a game-high 17 shots and logging four steals. 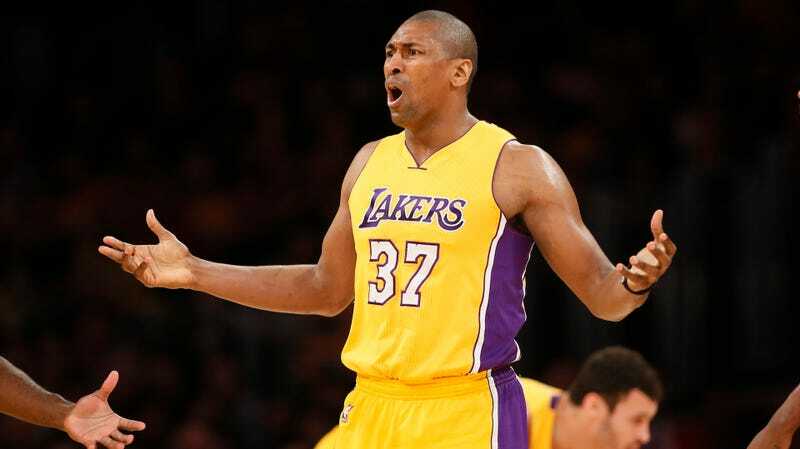 World Peace had taken 26 threes this season before tonight’s game, but he jacked up 10 tonight. Towards the end of the game, the Lakers went out of their way to let World Peace cook. He was happy to oblige and take his shots. Condolences to the Lakers for their fifth straight win.